This book and the practice of the Marathon Monks of Mount Hiei lay the foundation for the spiritual practice of the Bubishido Monks. Similar to their 1,000 day walk the Bubishido Monks work their way towards 1,000 days of kata. The determination and perseverance that is shown by the Marathon Monks lends inspiration to all martial artists and shows that we can always strive for something greater beyond our present limitations. 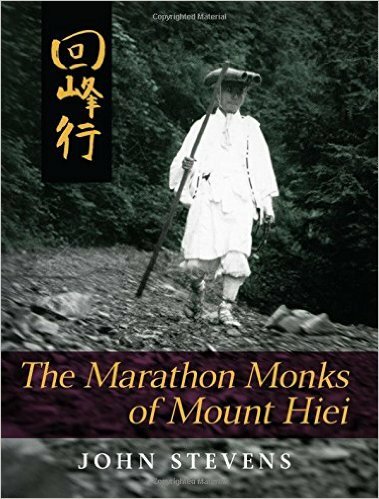 The greatest athletes in the world today are not the Olympic champions or the stars of professional sports, but the “marathon monks” of Japan’s sacred Mount Hiei. Over a seven-year training period, these “running buddhas” figuratively circle the globe on foot. During one incredible 100-day stretch, they cover 52.5 miles daily-twice the length of an Olympic marathon. And the prize they seek to capture is the greatest thing a human being can achieve: enlightenment in the here and now. This book is about these amazing men, the magic mountain on which they train, and the philosophy of Tendai Buddhism, which inspires them in their quest for the supreme. The reader will learn about the monks’ death-defying fasts, their vegetarian training diet, their handmade straw running shoes, and feats of endurance such as their ceremonial leap into a waterfall. Illustrated with superb photographs, the book also contains the first full-length study in English of Mount Hiei and Tendai Buddhism. John Stevens lived in Japan for thirty-five years, where he was a professor of Buddhist studies at Tohoku Fukushi University in Sendai.